At RHRLI, many of our patients are looking for a permanent solution to hair loss but can be a bit hesitant about seeking treatment. We often get patients who ask questions about whether the procedure will hurt. Others are concerned about how their hair will look after a hair transplant. Still, others have concerns about scarring and recovery time. 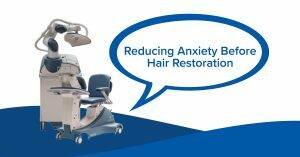 We know that patients have anxiety going into the procedure, but we also know we can reduce that anxiety because we have the most state of the art hair restoration system available. It’s called the ARTAS® system and it’s a minimally invasive procedure which uses robotic technology to give you a fuller, healthier head of hair. We want to show you how ARTAS® can effectively ease many of the worries you have going into your hair restoration procedure. We understand that a big worry for many patients is whether the procedure will hurt. The ARTAS® system is virtually pain-free. That’s because it’s a Follicular Unit Extraction (FUE) procedure which uses robotic technology to find donor hairs on the back or side of the head. This differs from less advanced procedures such as Follicular Unit Transplantation (FUT), commonly known as strip surgery. FUT is a surgical procedure. It involves the use of a scalpel to cut out scalp tissue from the back of your head. After the grafts are transplanted, the surgeon uses sutures to close the gap in the patient’s scalp, which will leave a scar. Typically, FUT patients will receive strong painkillers following the procedure. The ARTAS® system is much less invasive. Many patients report little or no pain following their hair restoration procedure, according to the company’s website. FUE patients usually don’t have to take strong prescription drugs. If there is some discomfort after the procedure, patients can take over-the-counter ibuprofen or acetaminophen. ARTAS® patients very often return to their normal lives immediately after the procedure. Having a hair restoration procedure with RHRLI and ARTAS® will also make you look great. There are non-robotic FUE procedures out there that don’t have the precision of our robotic technology. These hair transplants involve doctors using manual or motorized handheld devices. ARTAS® is more accurate and there’s less of a chance for human error. Our system also identifies the most optimal donor hairs, with the result being the healthiest looking head of hair you can find. And the ARTAS® system won’t leave a scar. That means you won’t have to change your hairstyle as a result of your operation. For the first three days after the procedure, you’ll be instructed not to aggressively manipulate the transplanted area with your fingertips or fingernails. You may shampoo softly in a circular motion, according to ARTAS®. We’re proud to be the only hair restoration center on Long Island that has the ARTAS®. It gives our patients peace of mind. You won’t have to worry about scarring or an unsatisfactory result when you have a hair restoration procedure at RHRLI. And the procedure is virtually pain-free. To schedule a consultation, contact RHRLI today.